The 6.0 release of IBM® Rational® Quality Manager (RQM) introduces a major new feature: configuration management. You can now manage the evolution of test artifacts using techniques similar to those which Rational Team Concert supports for managing source code. 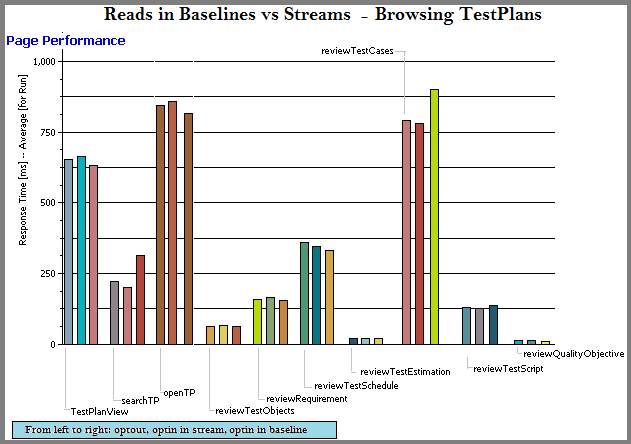 You can organize test artifacts into streams and baselines. You can easily reuse test artifacts by branching streams or baselines, and you can apply versioning across your entire CLM solution by using global configurations. This 6.0 report focuses on the new configuration management feature. It examines how response times are impacted by when adopting configuration management. 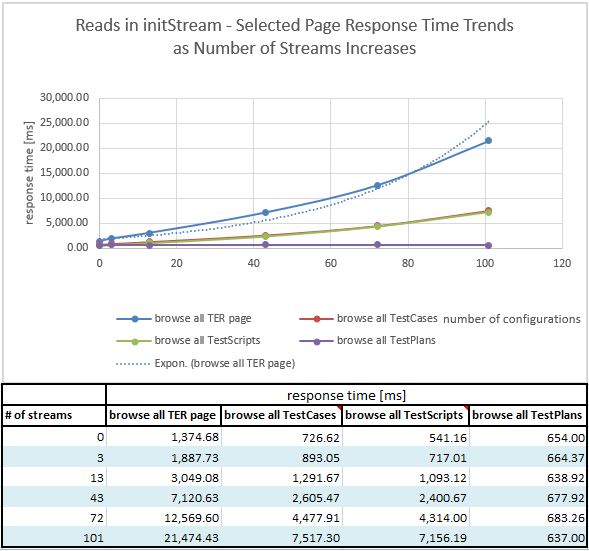 It also looks at the how response times are impacted by the number of streams or baselines. If you are not using configuration management, please refer to Collaborative Lifecycle management report: Rational Quality Manager 6.0 release. For more information on global configurations, please refer to Collaborative Lifecycle Management performance report: Global configuration and back link indexing. 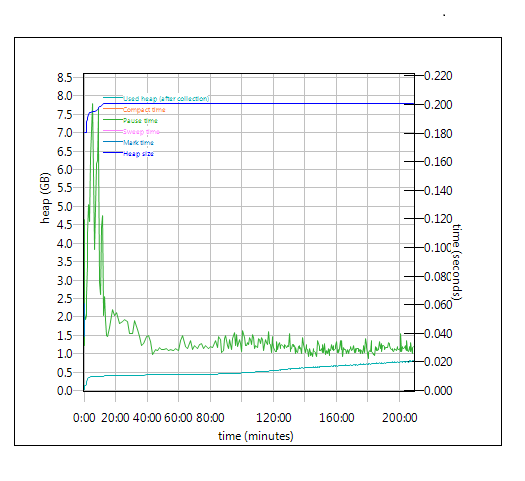 IBM® Rational® Performance Tester (RPT) was used to simulate traffic generated from a browser client. 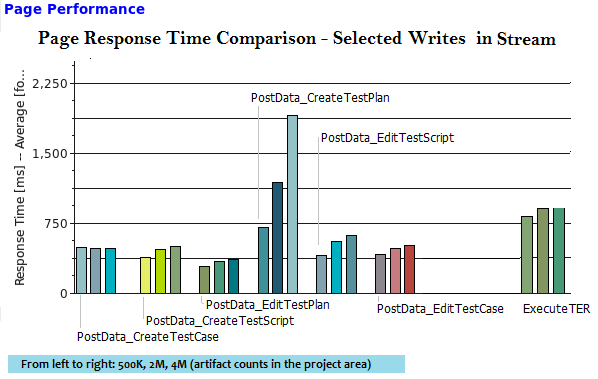 RPT test scripts were created for each use case. The scripts are organized by pages where each page represents a user action; Tests were run with a 60 second “think time” between pages for each user. The test environment is described in section Topology and Key configuration parameters. 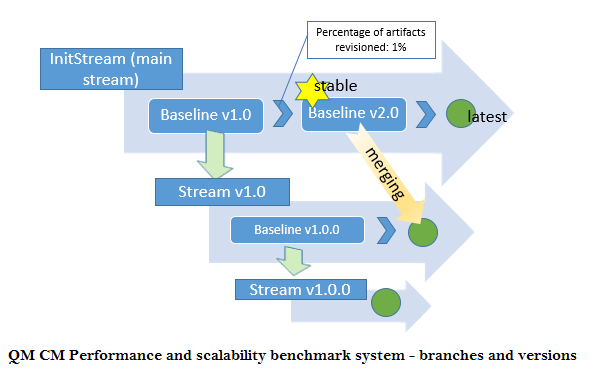 Test repositories were migrated from 5.0.2GA, but then the RQM projects were enabled for configuration management and additional streams and baselines were created. Additional details on the specific data shapes tested can be found in the Data Volume and shape section of Appendix A. 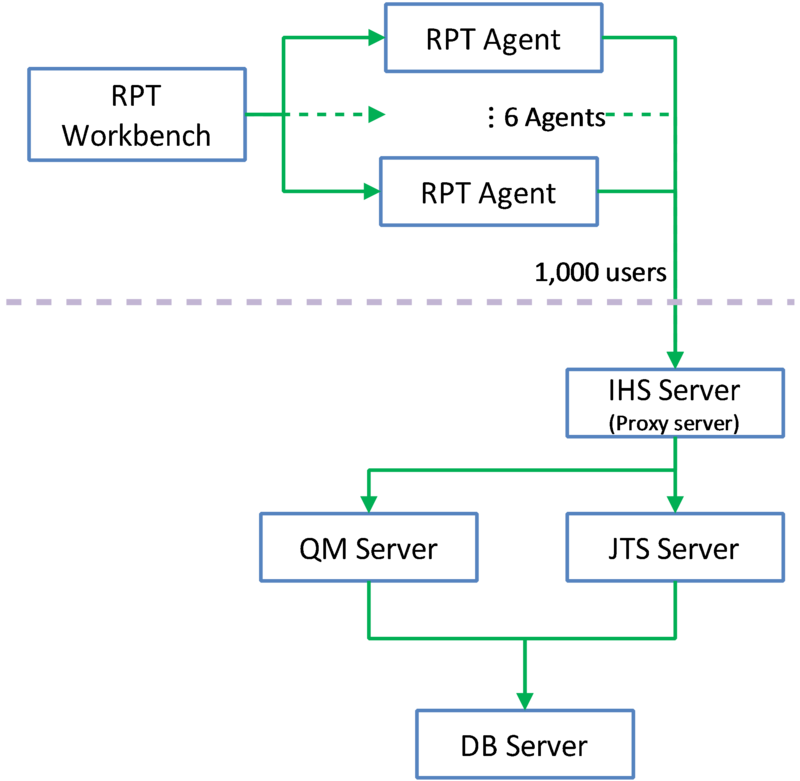 With configuration management enabled, in the context of a baseline. 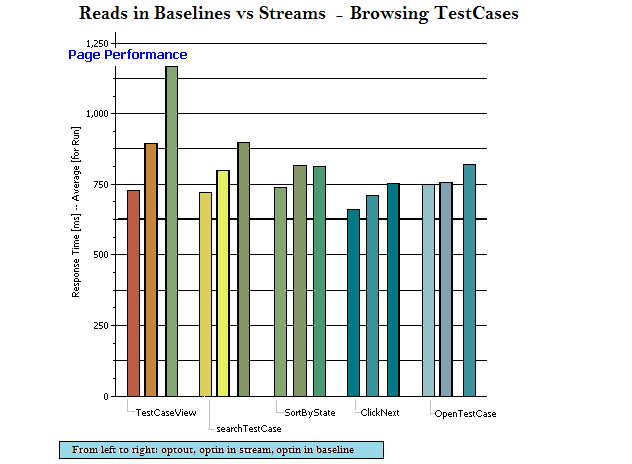 Here we looked only at read operations, since a baseline does not allow changes. There is a small cost to enabling configuration management. 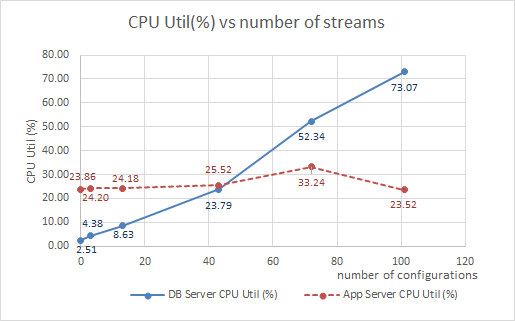 Most operations slow down slightly (< 250 ms) after enabling configuration management. 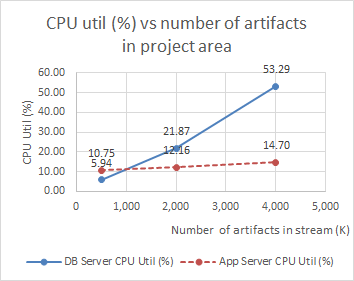 There is an additional cost when running in the context of a baseline (as opposed to a stream) for several operations (artifact browsing, searching, and sorting). 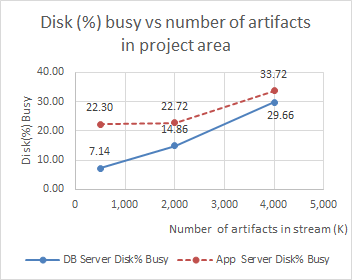 This operations can be as much as 250 ms slower in a baseline than in a stream, and as much as 500 ms slower in a baseline than with configuration management disabled. Create or edit operations were not impacted by the number of streams. 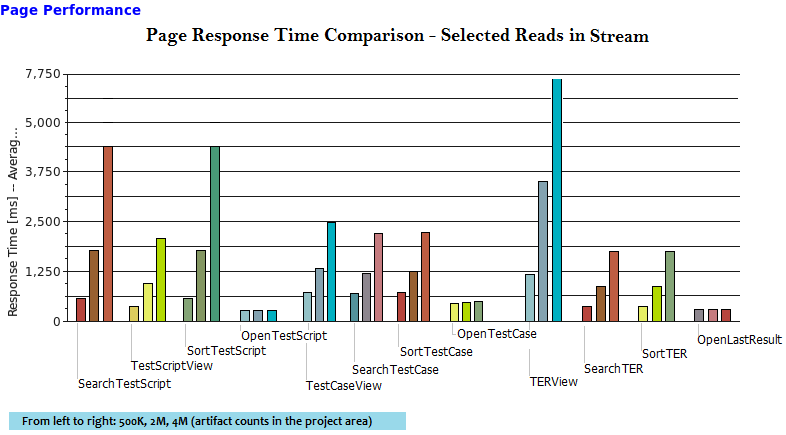 Some read operations (browsing test execution records and test scripts) became slower as the number of strames increased. 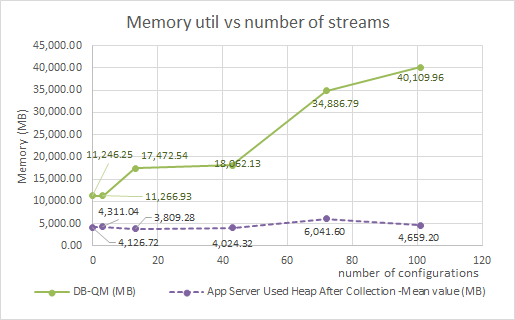 Memory and CPU usage on the database server increased as the number of streams increased. 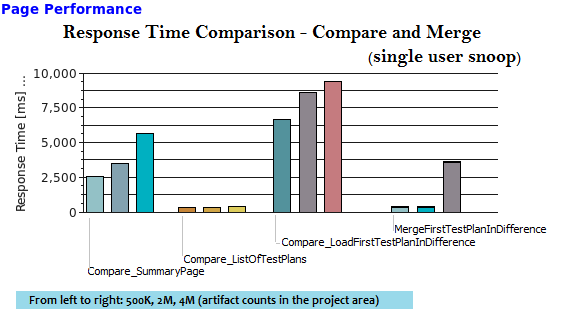 In this set of tests, we looked the impact of increasing the total number of artifacts in a single QM project area, with configuration management enabled. We started with our standard data shape of 500,000 artifacts, and expanded it to 2 million and 4 million artifacts. We ran the 1000 user workload against each of these 3 repositories, with configuration management enabled. The response times for operations are listed below. 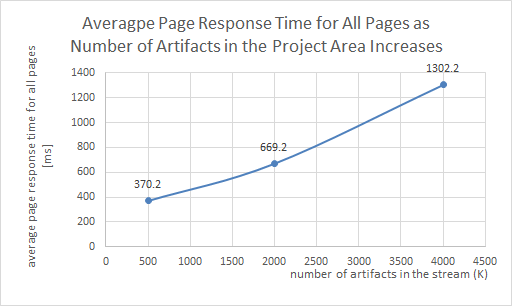 Response times degrade as the number of artifacts in a project area increases. 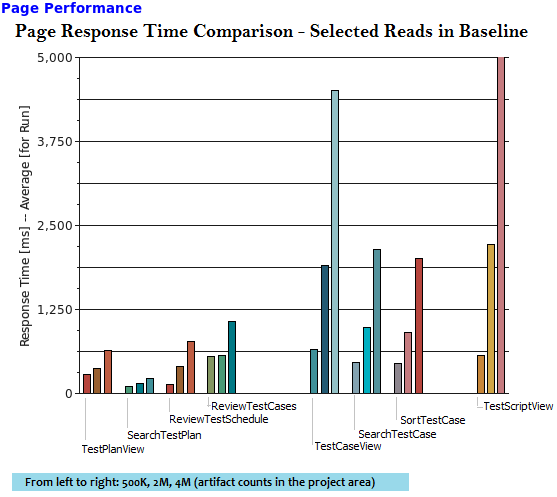 The response times in the 4M repository have degraded to a point where that system would be difficult to use. 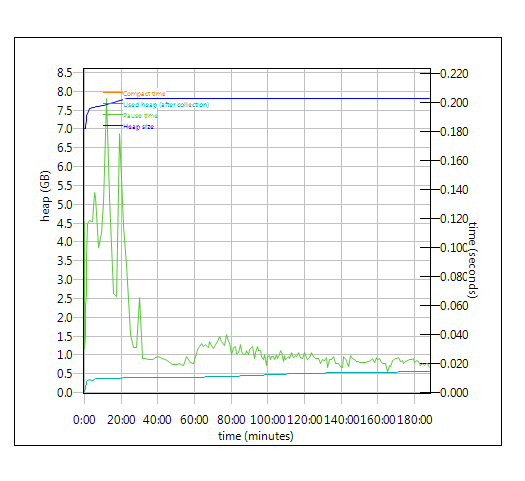 The graph below shows that the general performance degraded as the number of artifacts in the project area increased. It was also observed that the time to create a sub-stream has increased significantly as the size of the project area grew. 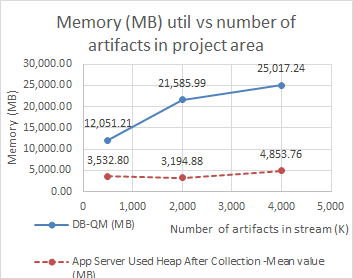 The artifacts were migrated from 5.0GA repository which contains a total of 579,142 artifacts in one large project. QE Manager 1 Test plan create:user creates test plan, then adds description, business objectives, test objectives, 2 test schedules, test estimate quality objectives and entry and exit criteria. 26 Browse test plans and test cases: user browses assets by: View Test Plans, then configure View Builder for name search; open test plan found, review various sections, then close. Search for test case by name, opens test case found, review various sections, then close. 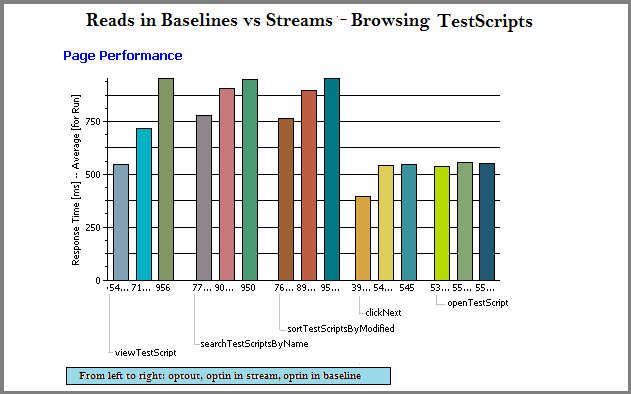 26 Browse test script: user search for test script by name, open it, reviews it, then closes. 1 Simple test plan copy: user search test plan by name, then select one, then make a copy. 23 Defect search: user searches for specific defect by number, user reviews the defect (pause), then closes. Test Lead 8 Edit Test Environment: user lists all test environments, and then selects one of the environments and modifies it. 15 Edit test plan: list all test plans; from query result, open a test plan for editing, add a test case to the test plan, a few other sections of the test plan are edited and then the test plan is saved. 4 Create test case: user create test case by: opening the Create Test Case page, enters data for a new test case, and then saves the test case. 1 Bulk edit of test cases: user searches for test cases with root name and edits all found with owner change. 3 Full text search: user does a full text search of all assets in repository using root name, then opens one of found items. 32 Browse test script: user search for test script by name, open it, reviews it, then closes. 26 Test Execution: selects “View Test Execution Records”, by name, starts execution, enters pass/fail verdict, reviews results, sets points then saves. 11 Defect search: user searches for specific defect by number, user reviews the defect (pause), then closes. Tester 7 Defect create: user creates defect by: opening the Create Defect page, enters data for a new defect, and then saves the defect. 4 Defect modify: user searches for specific defect by number, modifies it then saves it. 13 Defect search: user searches for specific defect by number, user reviews the defect (pause), then closes. 5 Edit test case: user searches Test Case by name, the test case is then opened in the editor, then a test script is added to the test case (user clicks next a few times (server size paging feature) before selecting test script), The test case is then saved. 3 Create test script: user creates test case by: selecting Create Test Script page, enters data for a new test script, and then saves the test script. 7 Edit test script: user selects Test Script by name. test script then opened for editing, modified and then saved. 41 Test Execution: selects “View Test Execution Records”, by name, starts execution, enters pass/fail verdict, reviews results, sets points then saves. 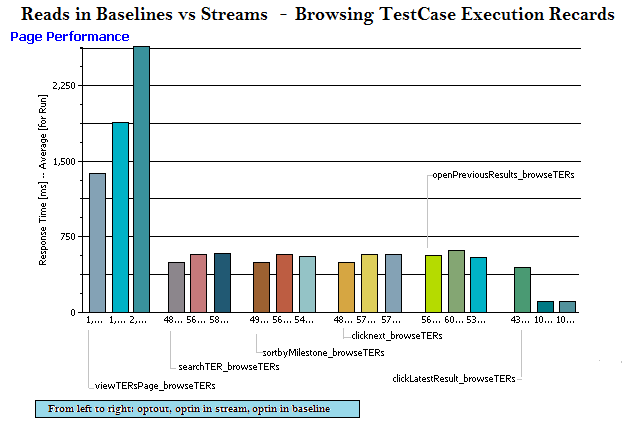 6 Browse test execution record: user browses TERs by: name, then selects the TER and opens the most recent results. IBM HTTP Server for WebSphere Application Server 8.5.0.1 IBM HTTP Server functions as a reverse proxy server implemented via Web server plug-in for WebSphere Application Server. Configuration details can be found from the CLM infocenter . Please refer to the article Collaborative Lifecycle Management performance report: Global configuration and back link indexing for information on what to expect when first activating the configuration management feature, and for information the performance of linking scenarios test artifacts and other tools like IBM Rational DOORS Next Generation or IBM Rational Team Concert. Verbose garbage collection is enabled to log the GC activities. 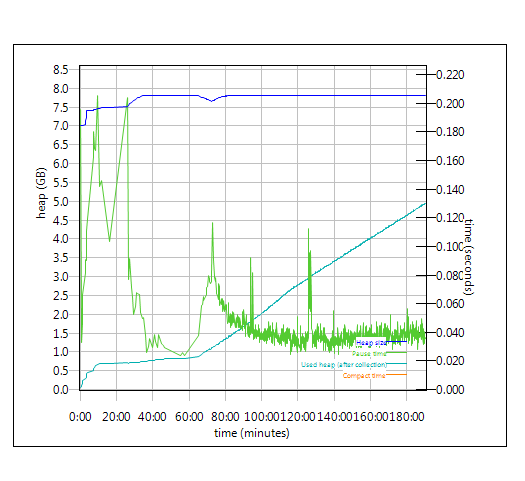 These GC logs showed very little variation between runs. There is also no discernible difference between versions. 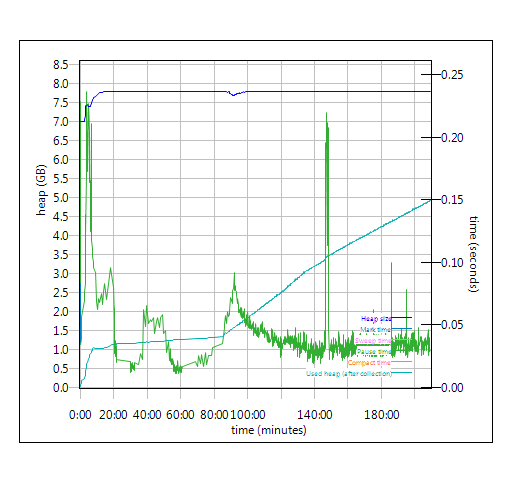 Below is one example of the output from the GC log for each application.